ATLANTA — Navistar International Corp. said the opening of a new parts distribution center in Memphis, Tenn., will enable it to guarantee overnight delivery of parts to dealers who place orders as late as 11 p.m. Eastern time the previous night. The 300,000-square-foot facility will open later this year, and its proximity to the FedEx global hub in Memphis will enable the company to make those overnight deliveries to more than 95% of their dealers, Michael Cancelliere, president of the company’s truck division, said during a March 18 press conference at American Trucking Associations’ 2019 Technology & Maintenance Council annual meeting here. Complementing the new later cutoff time for parts orders will be new enhancements to Navistar’s retail inventory management system, which will increase the breadth of parts maintained in dealer inventories while reducing the depth of parts dealers need to keep in stock. The company also is rolling out an updated parts inventory management program for its dealers to accommodate the availability of the late ordering. The system, called DIA, ensures that dealers have the right parts on the shelves to minimize downtime for customers, Cancelliere said. “Those dealers that are ready on DIA have seen a double-digit reduction in the amount of unplanned orders that they have to place,” he said. The updates were piloted at seven locations in the United States and Canada, and each location showed an improvement in on-shelf parts availability, Navistar said. The company added that the system will increase the breadth of parts maintained in dealer inventories while reducing the depth of parts they must keep in stock. 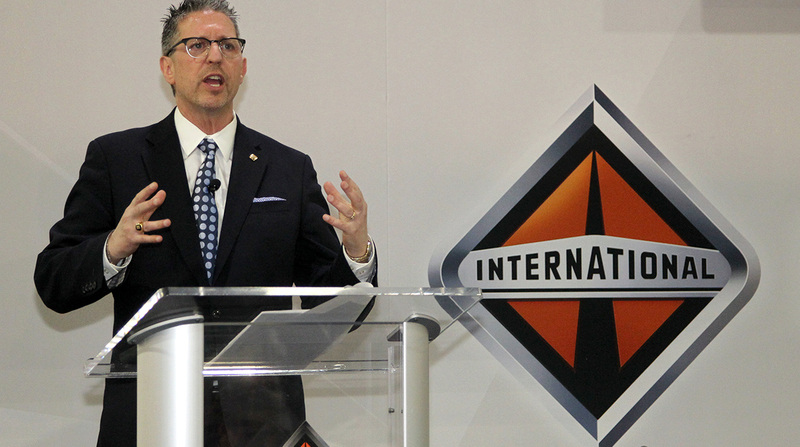 In addition, Navistar announced at the press conference that all International LT and RH Series trucks equipped with the company’s proprietary A26 engines and built after June of this year will come equipped with the capability to make remote, over-the-air cellular updates to engine calibrations and programmable parameters. Earlier this month, Navistar announced a service partnership with Love’s Travel Stops & Country Stores, adding more than 315 service locations and 1,000 technicians to the Navistar service network. The agreement covers warranty work on new and used Classes 6-8 trucks, he noted.